I love my red yoga mat that is full of stains. Like a loved teddy bear, my mat will have to be in pieces before I let it go. My mat has been with me through thick ‘n thin since my early 20’s when I taught myself step by step how to do each yoga posture with a little book written by Richard Hittleman. This was all back before my children were born and my career had taken off. Back when the days were seamless and I went wherever the wind seemed to blow. One of those places was Esalen in Big Sur; where my love for yoga deepened into the easy practice that I continue to this day. Since those more carefree days, I have moved 12 times. I have been a single mom not once but twice. I have married and divorced and married again. I have birthed 2 beautiful boys and I have lost a baby girl so small that she did fit in my hand. I have built a loving, welcoming home and created a career that I love. I have found my niche in life. 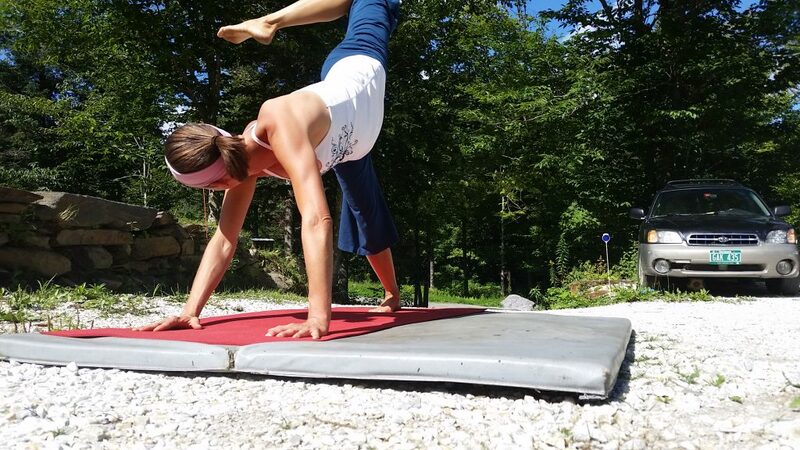 When I roll out my mat I breathe deep and fall down onto its plush feel. I let my body stretch in whatever way. Other times I follow along to a video. No matter which way I begin, the end result is the same, a whole and centered ME. I did yoga throughout my 1st pregnancy. After he was born and my belly button had resumed normal position, I rolled out my mat and put my new baby next to me on a blanket. Thus began ‘mom yoga’. As my baby got older and started to crawl he would wander quietly while I was upwards and downwards on my mat. He never crawled on my mat. It was as if he knew it was my place. To this day he is calm and quiet when I roll out my mat. When I became a single mom and worked 60+ hour weeks, I woke early to do yoga. It was my time of calm. When I became pregnant again, I was even more sick with hyperemesis gravidarum and had to roll up my mat for two years. When I got back on, I felt like an old car starting up after a long time sitting still. Yoga is my sanity, my freedom. There is nowhere else on earth, except maybe the ocean, where I feel more at home, most myself, and this is why I find myself on my red yoga mat time after time.